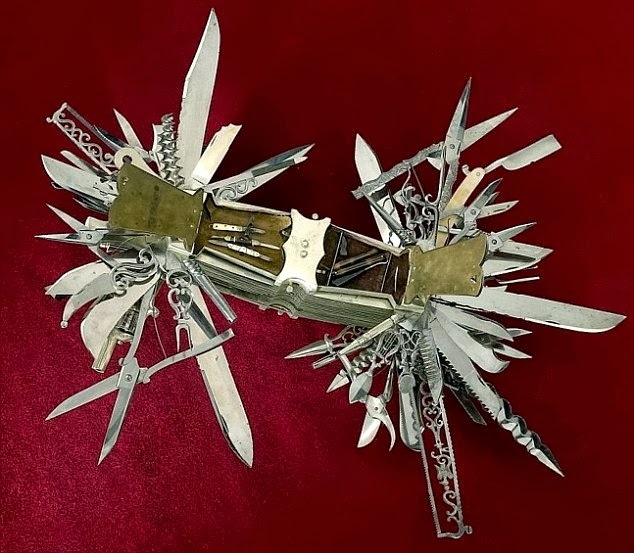 A device described as the 'mother of all Swiss Army knives' has gone on display, which features more than 100 tools - including a gun. The incredible multi-tool boasts everything from a piano tuner to a .22-caliber revolver. Owned by the Smithsonian Institution and on display at the Buffalo Bill Centre of the West in Wyoming, USA, the 'handy pocket knife' is just the tool for the typical 19th century gentleman. It includes a serrated blade, two dagger blades, several different types of shears and scissors and a corkscrew. Other features necessary for the hardy outdoors types during the turbulent days of the Wild West, include two saws, a lancet, button hook, cigar cutter, tuning fork, pens, a mechanical pencil, mirror, straight razor, a cheese fork and a butter knife. But one modern convenience the user would have to do without is the bottle opener, because the bottle cap as we know it today wasn't invented until 1892. The exquisite craftsmanship on the tortoise-shell handle even covers a selection of concealed miniature tools, from folding knives and scissors to a cut throat razor. Made in Germany in 1880 for JS Holler & Co's cutlery store in New York City, the beautifully crafted knife predates the Swiss Army knife by 11 years. According the Smithsonian website the knife - which is 3.5ins wide and 9ins long - wasn't really meant to be carried. It reads: 'Knives like this were made exclusively for exhibition to highlight the cutlers' art. 'They were so difficult to make they were only attempted by the most notable firms with the most talented artisans. The term 'Swiss Army Knife' came into being after US soldiers based in Germany during the Second World War had difficulty pronouncing the German name, Schweizer Offiziersmesser (Swiss Officer's Knife).